For a Smile that Speaks Volumes! 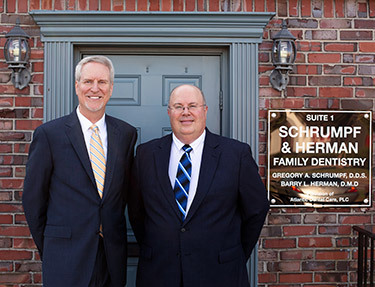 Since 1983, Schrumpf & Herman Family Dentistry has provided comfortable, high-quality dental care for families in Virginia Beach. We offer dental services in a clean, hi-tech – but home-like – environment. Virginia Beach dentists, Dr. Gregory Schrumpf and Dr. Barry Herman offer a wide range of dental services, from general dentistry and children's dental care to complex reconstructive treatment, including cosmetic enhancements, custom dentures, crowns and implants, and the amazing "same day" tooth replacement – all-on-4 dental implant restorations. All dental needs are routinely imaged on large-screen monitors for patient education. 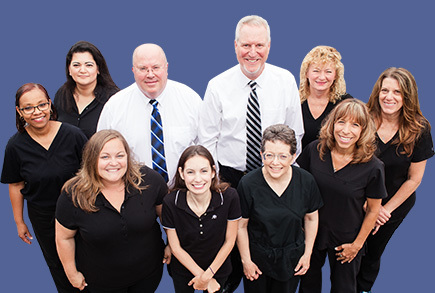 Our highly experienced staff has an impressive two hundred forty years of dental experience. As a team, we have completed thousands of hours of continuing education to better serve our patients. Dr. Schrumpf and Dr. Herman take a holistic approach to dentistry to ensure that smiles look beautiful and function harmoniously. The doctors schedule one to two hours of their time with all new patients to thoroughly evaluate, diagnose, and explain findings. Our team approach to dental care increases the dental IQ of our patients. 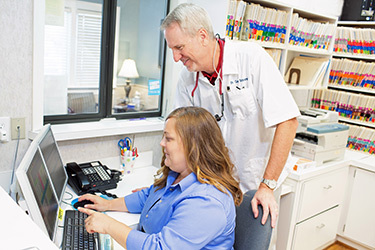 Whether you visit us for routine care or specific treatment, your Virginia Beach dentists will consider all aspects of your concerns, desires, and health needs to tailor a solution that provides lifelong benefits. Planned treatment can be efficiently completed over a short period or staged over time, if needed. At Schrumpf & Herman Family Dentistry, we constantly review and choose the latest technology that we feel best help us serve our patients. We offer the most highly reviewed materials and techniques that have withstood the test of time. From digital radiography to drill-less fillings, laser gum contouring to the most natural tooth-colored restorations, you will experience the benefits of contemporary dental care in a safe, relaxing environment. Our doctors and team utilize meticulous sterilization procedures and adhere to the highest standards of safety to ensure the wellbeing of our patients. The procedure and course of action for receiving double crowns were explained in detail and I was continually updated on the progress. Dr. Schrumpf's experience and excellent surgical technique caused minimal discomfort despite the complexity involved. The staff is very congenial and professional. My healing is going much better than anticipated! I have been going to this dental office for many years. I highly recommend them for any dental work needed. They are friendly, compassionate, professional & thorough. I love them!!! Excellent care, very kind and professional doctors & assistants. Warm and welcoming environment coupled with gentle expert dental care. I have had dentist anxiety most of my life left over from early experiences, so i totally appreciate the care, kindness, and efforts to let me relax, and enjoy going for cleanings, fillings, and even root canals. I'd certainly recommend Dr. Schrumpf and staff to anyone searching for a "painless dentist". They are so professional and GREAT with my kids! The ladies even took my daughter on a walk because she was getting restless during my cleaning. I love that it is a small office and they remember us every time we come in!